Although the hole will not close completely until mid century at the earliest, the healing is reassuring to scientists who pushed for the Montreal Protocol. The 1987 international agreement phased out the industrial production of chlorofluorocarbons (CFCs): chlorine-containing chemicals that help trigger the destruction of stratospheric ozone, which screens out cancer-causing ultraviolet light. The Montreal Protocol was accepted almost universally and successfully gained global cooperation to reduce the production and release of Ozone Depleting Substances (ODS). When Chlorofluorocarbons (CFCs) are released the free chlorine molecules that become available in the atmosphere are able to deplete the O₃ ozone molecule in a catalytic reaction allowing Ultraviolet (UV-B) radiation to enter the atmosphere. Layers of depleted ozone open up over both poles just as winter gives way to spring. During the wintertime cold, nitric acid and water condense out of the atmosphere and form wispy clouds. The surfaces of the cloud particles host chemical reactions that release chlorine that came from CFCs. The chlorine, in turn, goes on to destroy ozone—but only in the presence of light. That is why, over Antarctica, ozone loss doesn’t get going in earnest until September, the beginning of the southern spring, when light returns to the pole. Peak losses are usually in October, and that is when researchers have typically taken stock of year-to-year changes in the hole. The current year’s ozone hole plot shows the progression of this year’s ozone hole (red line) and is placed in reference with last year’s ozone hole conditions (blue line) and conditions over the previous ten years. The maximum ozone hole area for each day over the ten year period is shown as the upper black line. The minimum ozone hole area for each day of this same period is shown as the lower black line. 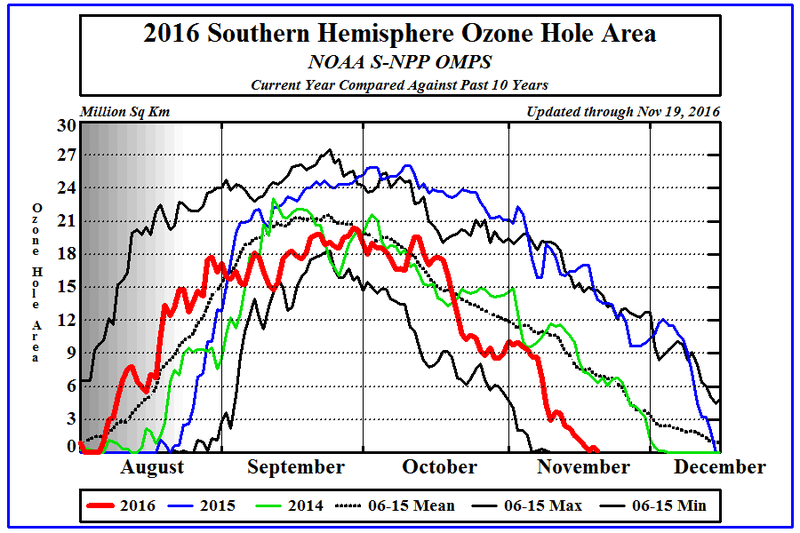 The mean ozone hole area for each day over this period is shown as the green line. The gray shaded area in August depicts the decreasing degree of uncertainty in the ozone hole size estimate as more of the polar region becomes sunlit. The figure will be updated twice weekly from September through December to show the progress of the current year’s ozone hole.